The rise of Islamist politics, both reformist and revolutionary, is a relatively new phenomenon; so what has changed that has allowed this to happen? My historical and sociological research into immigrant politics, and especially the politics of the Bengalis in London’s East End, leads to an answer that few politicians want to hear. Islamism has been able to attract people looking for an escape from the brutality and banality of capitalism because the socialist alternative that would once have claimed them has been systematically traduced and undermined. The rise of Islamism has been made possible by the decline of socialism – which has been under constant attack from the same powers who publicly bemoan Islamist dominance. (And this is still going on, as the deliberate marginalisation of the secular and leftist Kurdish movement in northern Syria so poignantly demonstrates.) The 2002 article in which I first made these arguments has been widely quoted, including in a paper commissioned by the UK Government; but my inconvenient argument is never taken up or even discussed. Of course, the process of this political evolution has been complicated; and, as the Bengali case history demonstrates, these realignments are a product of developments in progressive left politics as well as of the apparent triumph of neoliberal capitalism. Comparisons are often made between the Bengali East End and the Jewish East End of an earlier generation. That Jewish East End nurtured a tradition of active secular left politics, including strong support for the Communist Party. The Communist Party was a dominant influence on the political mobilisation of the early Bengali immigrants too, as it was in anti-colonial and post-colonial movements more generally. But, as in other similar movements, the popular front politics promoted by the Communist international allowed socialist aims to be postponed into an indefinite future while activists focused on the ‘first stage’ of national liberation. For the people from East Bengal, their struggle for independence from the British Empire, which took place when the immigrant community numbered only one or two hundred, had been riven by religious sectarianism; but the bloody battle for an independent Bangladesh in 1971 was fought in the name of a secular socialist republic. The more radical left put aside their differences with the nationalists in the joint fight for independence, but when that independence was won, the left found themselves sidelined. This was true among the East End Bengalis too. The left had been so busy campaigning for independence and organising day-to-day community work that their socialism had been left on the back burner. These first London Bengali activists had built up a strong practice of grass-roots political organisation, but it was focused on the practical issues that beset a poor immigrant community facing increasingly racist immigration restrictions. It failed to aspire to make more ideological change. Meanwhile, wider progressive politics was undergoing a cultural turn that downplayed the role of economic forces and class conflict and prioritised the politics of identity. In the East End, Black Radical activists from Race Today were instrumental in establishing the Bengali Housing Action Group that helped solidify campaigning along ethnic lines; and growing racism was countered by Bengali youth groups. These mobilisations achieved real improvements to people’s lives and to Bengali self-confidence, but they could not build bridges between different ethnicities as had been so deliberately achieved by the class-based politics of the 1930s. Nor could they address the fundamental economic inequalities that transcended different ethnic groups. Black Radicalism opened a Pandora’s Box of separatist organisation, and as this approach became institutionalised into political multiculturalism, these different organisations were encouraged to compete with each other for portions of government funding. Lingering traces of radicalism were tamed and incorporated into the system. Meanwhile, the East End, like other immigrant areas, remained a significantly deprived area, and the Bengalis remained a disproportionately deprived group. While the turn to religion can be understood as responding to the need for an ideological counter to a system that produced such deprivation, religious identity has also been encouraged by multicultural policies that have increasingly regarded people as members of religious groups and awarded prominent roles to religious organisations and leaders. Some left organisations have also been complicit in this, blurring the line between campaigning against religious discrimination and actively promoting religious groups. The Stop the War Movement and George Galloway’s Respect that emerged out of it allowed the popular front put together to oppose the wars in Afghanistan and Iraq not just to eclipse much of their left ideology but also to strengthen political involvement via Muslim (and Bengali) identity. The impact of Western foreign policy on Islamist radicalisation has been widely acknowledged, but the growth of British Islamism preceded 9/11. Islamist movements were already well established even before the boosts given by the perceived neglect of the suffering of Bosnian Muslims and the publication of Rushdie’s Satanic Verses. 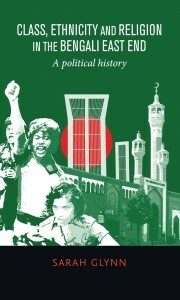 For young Bengalis growing up with limited prospects, Islamist idealism and the international brotherhood of the ummah (or Muslim community) can be seen as an inspiring alternative to the pointless selfishness of capitalist materialism – and an escape from the temptations of drugs and gang wars. The mainstream reformist Islamist groups around the East London Mosque have strengthened their position in the wider Bengali community through a well-ordered structure and active participation in grassroots community-work, aping the tactics of communist organisations. More revolutionary groups have been active in colleges and universities. The inverse relationship between strong left movements and strong political Islam has long been understood by Islamists, just as it has by Marxists. They recognise each other as incompatible ideological systems, and they know that both will compete for supporters from the same disgruntled victims of capitalism. Among immigrants of Muslim background, just as in the countries of the Middle East, the effective counter to Islamic radicalism has been historically demonstrated to be a strong secular socialist movement. Try telling that to David Cameron. To order your copy of Class, ethnicity and religion in the Bengali East End with a special 20% discount, simply contact NBN International on +44 (0)1752 202301, or email [email protected], quoting the discount code OTH547. Offer expires 31/12/2015. Category: Cultural Studies, International Relations, Politics, Religion	23 Comments.